Just a few weeks ago, these four were living in a roadside zoo. Their home was an empty cage with concrete floors and they were lacking the proper care and love that they both need and deserve. Thank you so much to the ALDF Animal Legal Defense Fund for helping to make this rescue happen, and for all of the hard work they do to keep animals safe. To watch their video about the rescue, click here. Meet the Peafowl - Yogendra, Anju, Karuna, and Uma - the newest members of the Indraloka family! 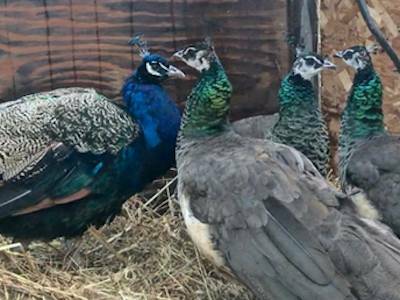 Happily, and thanks to your support, Indraloka was able to provide a forever home for the peafowl, and they moved into their new home that same day. When they arrived they were a bit timid around humans - understandable as they had spent their entire lives on display for so many strangers. Slowly, they acclimated to their new surroundings at Indraloka, and recently, they have started to show their true, beautiful personalities to the other animals and their human caregivers. Yogendra, Anju, Karuna, and Uma have enjoyed the first days of their new lives basking in the sunshine and snacking on their new favorite foods - grapes and sunflower seeds. At night, they can be heard talking to each other in a low, exotic whisper. We can see that they love each other very much, and we are grateful they were able to stay together. Oh, and Majja the Fabu- Indraloka's sole peacock resident until the rescue- is very excited about our new residents, and we are very happy he now has family members just like him to bond with! This rescue would not have been possible without the support of loving humans like you. Unfortunately, these stories are all too common. Many more animals are living in cruel conditions and are not receiving the appropriate care they deserve. Please consider donating in Yogendra, Anju, Karuna and Uma's names so more animals can have happy endings to their stories in 2018.